Volunteers will yank out sections of paving from the Mt. Hood Community College parking lot and the blacktop will eventually be replaced with rain gardens to filter polluted rain water and make the parking area more earth-friendly. This project will "bring community members together to have a direct positive impact on the local watershed," said Erica Mattison, executive director of Depave, a nonprofit organization working on the pavement removal, in an announcement. The event will run from 9 a.m. to 2 p.m. Saturday, May 19, at the college at 26000 S.E. Stark St. The college property is a key component to the well-being of the Sandy River and the area's entire watershed. About one-and-a-half-miles of Beaver Creek and Kelly Creek run through the 212-acre MHCC campus and merge there to flow to the Sandy River. It is estimated that nearly one in 10 juvenile fish in the Sandy Basin move through Beaver Creek. 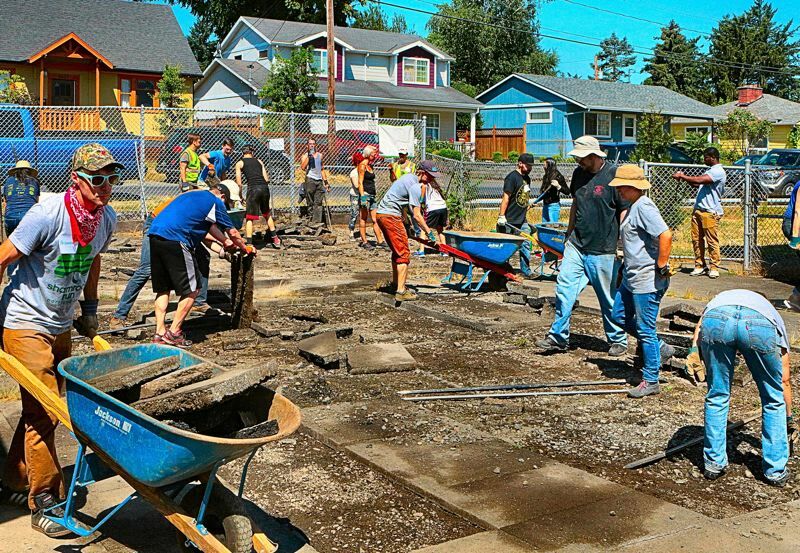 Volunteers will work under the guidance of Portland-based Depave. They will remove several sections of pavement in select parking areas and put in the gardens to capture and filter polluted stormwater runoff. The project will have minimal effect on the number of parking places at MHCC. "We're proud of our efforts in conservation and sustainability here at Mt. Hood Community College," said Debra Derr, president of MHCC, in the announcement. The college earlier earned certification as a Salmon-Safe enterprise with its environment-friendly practices. "As the first Salmon-Safe certified community college in the nation, we're leading the charge to protect our natural spaces on campus. And we're excited to partner with the Sandy River Watershed Council, Depave and other community groups on this," Derr said. Depave said it is dedicated to replacing paved surfaces with living green spaces that also build community and reconnect landscape with nature. The organization has completed 60 projects since forming 11 years ago. The project also includes the environmental nonprofit Sandy River Watershed Council and funding from Metro regional government, the city of Gresham, East Multnomah Soil and Water Conservation District, Spirit Mountain Community Fund and the Department of Environmental Quality. The Sandy River Basin Watershed Council works on habitat restoration and education throughout the Sandy watershed and tributaries including the Bull Run, Zigzag and Salmon rivers. As with many volunteer projects, there is satisfaction to be found in pitching in. "When volunteers take part in our work parties as they help to free the soil, they themselves tend to feel liberated and empowered," she said.